A look at building envelopes with a special focus on metal buildings. Bill Beals, District Manager of Therm-All Insulation (www.therm-all.com), is a 28-year veteran of the metal building industry and a contributing member of several committees, including the Metal Building Manufacturers Association (MBMA) Energy Committee and NIA’s Metal Building Insulation Laminators Committee. Mr. Beals also belongs to the International Code Council (ICC) and is often invited to share his extensive energy code knowledge through presentations at industry conferences. Mr. Beals has contributed to many articles and reference guides, and authors bi-monthly commercial energy codes blog called “The Code Man.” He can be reached at wbeals@therm-all.com. Tom Olver is a District Sales Manager for Therm-All (www.therm-all.com) and has 27 years of construction experience from the general construction and pre-engineered realms. Mr. Olver started in the pre-engineered building industry working as a project manager for a Design build/Butler builder and has served as a District Sales Manager with Nucor and NCI. His position with Therm-All pulls from a wide range of experience: project management, design build, pre-engineered building sales, thermal envelope design, energy code compliance, and value engineering. He can be reached at tolver@therm-all.com. Building envelopes are defined as a physical barrier between the conditioned space and unconditioned space and/or the outside of a building. The envelope, however, does more than separate spaces. It is a combination of materials serving several functions, including serving as weather barrier, air barrier, sound barrier, and a natural light and wind barrier. It also improves thermal performance and can serve a structural function. As an example, a conventional building framed from unit masonry with veneers of stucco or exterior insulation and finish system (EIFS) provides physical structural support and air barrier functions within the masonry itself. With the addition of an insulating layer, the masonry wall “assembly” becomes the entire thermal envelope. The materials in the building envelope join the foundation, wall, and roof assemblies, and any glazing (windows), doors, and any other component installed within these assemblies. It’s crucial that all these materials are compatible and installed in a manner that ensures the building envelope performs as designed. Building envelope has many construction types for both commercial and residential applications. The building envelope design has evolved over the years based on the code cycles. ASHRAE 90.1 is a 3-year cycle. Each cycle has changes that need to be addressed. ASHRAE 90.1 covers the thermal envelope, lighting systems, and mechanical systems. The International Energy Conservation Code (IECC) is another 3-year cycle of the same basic parts: thermal, lighting, and mechanicals. Building designers can choose either option in most cases. However, some states have code-specific requirements that may not allow this. There are also above-code programs that designers can use for more reduced energy overall. ASHRAE, for example, has the 189.1 High-Performance Green Buildings. This is much more involved than the IECC codes and ASHRAE 90.1 Standard. 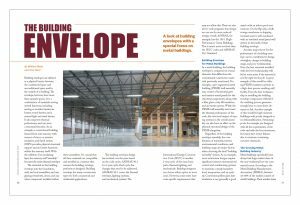 In a metal building, the building envelope is comprised of several elements that differ from the conventional construction materials previously mentioned. For example, a pre-engineered metal building (PEMB) wall assembly may consist of horizontal girts and exterior metal panels for the structural components, along with a fiber glass cavity fill insulation and air barrier system. While the PEMB wall assembly must meet the thermal performance of the code, the structural impact of varying systems in the overall assembly can also have an affect on the physical structural design of the PEMB altogether. Regardless of the building envelope assembly, the combination of materials, interior environmental conditions, and building usage are major factors when choosing the final “building assembly” system. As an example, most natatorium designs require significant interior environmental control and conditioning systems to maintain a steady humidity level, temperature, and air quality. Conventional fiber glass batt insulation is not generally a good match with an indoor pool environment. On the flip side, a bulk storage warehouse or shipping terminal may be well outclassed with an insulated metal panel wall system in the build of their building envelope. Metal buildings specifically have always had huge market share in the non-residential low-rise commercial sector. According to the Metal Building Manufacturers Association (MBMA), between 42–48% of the market consists of metal buildings. Their market share for commercial office buildings, retail, and government construction projects also continues to grow. The metal building market has seen many changes over the last 10 years in regard to energy efficiency, design criteria through the International Code Council (ICC), and fire ratings for assemblies. Energy consumption is one of the key design factors of buildings today. Energy codes, green buildings, renewable energy, and energy efficiency drive new builds and the expansion of existing structures. Most design teams utilize advanced energy calculation models and integrated mechanical control systems, which maximize efficiency and off-hour energy savings. Some systems may have an impact on the structure itself, such as physical load imparted by a photovoltaic cell system or a hydronic water heating system. When looking at the whole building envelope, these auxiliary systems have a positive impact on the envelope efficiency. The quality and flexibility of metal buildings today is a testament to performance of metal building insulation products over many years. For example, one of the industry’s leading manufacturers go-to standing seam roof panel was actually introduced in 1969. The standing seam roof panel of 50 years ago was well ahead of its time and is still in service on many buildings today. Building on these products, insulation system advancements have led to increases in energy efficiency, as well as significant building code updates, which add to both the efficiency and longevity of metal building systems. The impact on the building envelope by all this progress yields a far more energy-efficient shell that will last a lifetime when properly maintained. All envelope construction types have seen significant changes over the last 10 years. The energy codes have evolved to impact each construction type. Back in 2007, even though the codes were published and available to designers, they were very basic and not very energy efficient. Keep in mind that for several years, energy costs were inexpensive. From 2007 on, the 3-year cycle of codes began to change, as did energy costs. The metal building industry has seen very significant changes to the envelopes. Even though codes require R-value combinations, all envelopes and components of envelopes are in-place U-value performance based. To better understand this, consider a standard metal roof. In 2007, the in-place U-value for many climate zones was U-0.065 by code. By 2012 and beyond, it changed to U-0.035. Because the R-value is a reciprocal of the U-value, we can see the U-.065 has an in-place R-value of 15.38 for 2007 and in-place R-value of 28.57 in 2012. The walls for metal buildings have also changed, and we are seeing huge gains with insulated metal panels. Metal building laminators have had to adapt to these changing conditions. In earlier years, many laminators were working with a simple laminated fiber glass for metal buildings and the contractor determined what thickness and widths would be supplied. Now, with the evolution of the codes and thermal efficiencies, it is important for laminators to become involved in the code process; indeed, many are involved in ASHRAE and IECC and participate in the process of each code cycle. Many contractors now rely on laminators for code-compliant systems and guidance. Through this process, many changes have been implemented that have made parts of the code into mandatory provisions. Two examples are daylighting and air barriers. Both were once just part of the code and had several exceptions. Now, as mandatory provisions, the choice of materials, combining of materials, and overall performance in place have to be considered in the design and planning stage. Another consideration for the metal building envelope is the impact on the structure itself. Many manufacturers design with a specific “diaphragm” coefficient in mind. Changing an insulation system after the metal building has been designed can be problematic. As an example, let’s assume the metal building supplier designs a building with conventional R panel on the exterior walls and they anticipate a single compressed layer of laminated fiber glass over the exterior surface of the wall girts. After the design is complete (or worse yet, after the building is fabricated) the designer, owner, or customer decides to introduce several inches of rigid board on the exterior of the building for better energy efficiency. While great for energy savings, the structural impact of taking the girts from a braced to unbraced condition, changes in base and transition trims, and lengths of roof panels, can all be impacted with a change of this nature. In many cases, if the building has been fabricated, a change of this magnitude may be financially impossible. Overall consideration of the insulation envelope as a part of the metal building envelope should be an initial step and not an afterthought. Energy codes are rapidly advancing and economical systems exist to meet these new codes. Proper early planning can further reduce the negative cost impact of these systems too. With appropriate planning, design, and installation, metal buildings can deliver the thermal performance and efficiency gains that are desirable for many different commercial and residential projects.